The VAX 11/780 was introduced on October 25, 1977 at the Digital Equipment Corporation's Annual Meeting of Shareholders. 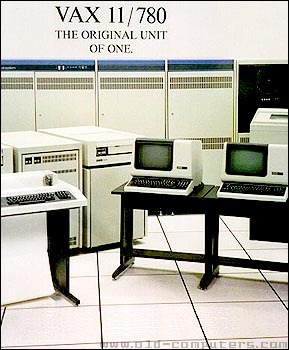 It was the first member of the VAX computer family, the first commercially available 32-bit computer and the first one MIPS (one million instructions per second) machine. The computer and its operating system (VMS) were designed both from scratch. The result was a really reliable, powerful and user-friendly system. The affordable price level allowed many institutions and universities to acquire it. In a VAX, one finds the basic architecture of the previous Digital PDP-11. Both systems were partially hardware and software compatible. However, the Virtual Address eXtension (VAX) allowed the use of 32-bit addressing, the number of the processor general registers has been doubled (16 instead of 8) and the instructions set deeply improved. The systeme bus, called LSI-11 then Q-Bus was the same as the PDP-11's. The Vax 11/780 was UNIBUS based system (16 bits). For many years, VAX 11/780 remained the base system every computer speed benchmarks refered to. Several programming languages could be used, such as Fortran-77, Cobol, Bliss-32, PL/I, BASIC, PASCAL, CORAL 66, and a netware software called DecNet. The VAX 11 series was sold until 1988. A dual processor version has been launched in 1981 (11/782) as well as various systems, from the small VAXstation 1 up to the VAX 9000 mainframe. The VMS operating system is still sold by Digital (bought by Compaq in 1999) and it seems that a few of VAX 11/780 were still in use in the year 2000. The photo below is of Proto Type 15, the first Vax to have cabinet skins, taken in Tewksbury, Massachusetts, about 1977.